While it may appear in the media that anyone with a two-sentence patent claim and contingency agreement is racking up huge infringement awards without trying, the facts show that NPEs and operating companies alike are winning much smaller median litigation awards, and when they win big they frequently are not getting paid at all. Median patent holder damages awards were less than half in 2006-2011 than what they were in 2001-2005, down to just $4 million. 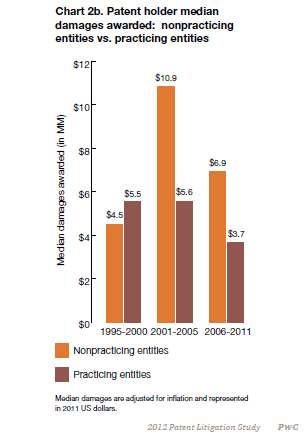 NPE awards are still almost double those of practicing entities (chart. 2b), however, typically they do not reach even tens of millions of dollars. Hundred million dollar cases are extremely rare. While patent suits were up in 2011 more than in recent years, trials remained essentially flat at about 100. patent trials are down relative to the dramatic increase in filings and patent grants. The PwC study does not examine why NPE awards are higher than those of practicing entities. It could have to do with (1) the higher quality of the patents being enforced and the resulting amount of damages, and (2) the commitment on the part of NPEs to litigate for the highest awards and royalties, not freedom to operate. Additionally, perhaps NPEs are better equipped than operating companies to manage the risky business of patent enforcement. The PwC study does not specifically address patent privateers, businesses that monetize patents on behalf of operating companies, which either sell the patents outright to them or, sell them for some upfront cash while retaining a percentage of potential damages, settlements or future licensing revenues. Privateers are a smart solution for many operating businesses who would rather collect a little something now and lay-off the risks associated with enforcement, especially if they may involve customers or leave them vulnerable to counter claims. 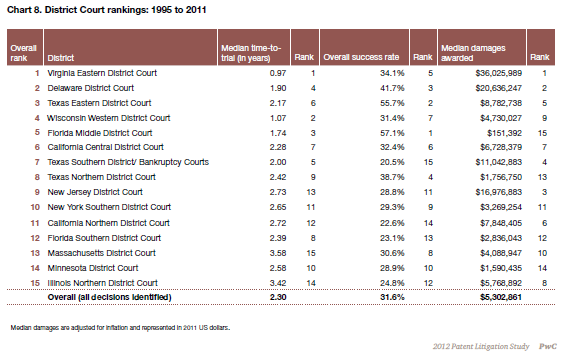 The study’s district court data is very interesting. Delaware has beat out Texas for the most popular fast track patent court, 105 cases to 91, both with about a two-year time to trial (chart 7d). Florida is now higher than Texas in terms of over all plaintiff success rate, 57.1% to 55.7%. As far as median damages are concerned, Virginia’s Eastern District is by far the best, coming in at $36 million. It is followed by Delaware, New Jersey and then Southern (not Eastern) District of Texas, at approximately $20 million, $17 million and $11 million respectively (chart 8). Industry issues, such as which businesses are in a particular district (e.g. several pharma companies are headquartered in NJ) may be a factor. Also, getting a case heard in a particular venue is not always as easy as it might appear. Of the ten largest adjudicated patent awards between 1995 and 2011, most have been “vacated, remanded, reversed or reduced, while some remain in the appellate process.” Microsoft was a defendant in five of them (chart 2c) . As much as I don’t like admitting it, MS has done an exemplary job of IP management over the past ten years. It has been successfully filing, licensing, defending, buying and (in the case of Facebook), re-selling patents. MS’ Android license gives it approximately $3-$6 of almost every Android phone sold, or, at last count, about a half billion dollars in annual royalties. This strategy is reminiscent of IBM’s success in licensing the early PC makers, while a laggard with its own desktops. The 2012 litigation study does not take into account that for some practicing entities licensing patents can be far more lucrative than manufacturing and selling products. It simply the economics of some industries, like semiconductors. Unlike operating companies, NPE licensing frequently requires that a suit be filed first to get the attention of management, as well as to avoid a declaratory judgment action that could shift a case to an unfavorable venue. Disclosure: Exclusive of Abbott the author does not own any shares of the companies mentioned above.